A recurring theme in the majority of recent monologues that appear in this space is notes from the edge. I mention it only by way of explanation for those who, from time to time, assign heft and meaning to words that were never intended to carry more than the weight of an emaciated donut hole, or the meaning of a random pattern of lines scribbled in the margin of a notepad while on hold during a phone call. When I assign a monologue to that notes from the edge category, it's generally safe to assume that (1) any logic contained therein is likely to be eccentric at best, (2) I have made no special effort to communicate serious thought, and (3) it's likely the monologue has been triggered by the sorts of fleeting thought fragments that so often result in fleeting, fragmented thoughts in written form. In other words, they're absurd concatenations, not vessels of occulted meaning. To illustrate, I'll use Friday's monologue as an example of how things might go terribly wrong, given a particular mix of circumstances and perceptions. As you've probably guessed by now, the past three weeks have been largely occupied by graphics, graphics, and graphics, some of which have already found their way onto my new space at Zazzle. The process is cumbersome and often tedious, not because the actual product creation on Zazzle is cumbersome and tedious—it's a no-brainer—but because of the time and inspiration required to actually create those graphics in the first place, followed by the inevitable overhead that comes from software glitches and the uncooperative attitude of computers in general. Then there's the tweaking, rethinking, and redoing, followed by poring over the data from Google Analytics. The process has left me bereft, and in need of an extended vacation with no access to computers. Last Thursday's Hide In Plain Sight poster—and the ancillary, obligatory t-shirt—began with an old friend's remark about "holding out for the pencil sketch of the tree." It's actually a pen and ink drawing, but nevertheless resulted in a concerted effort to make it ready for the marketplace. Although I generally try to have some sort of semi-related gibberish posted on the blog in honor of a new item's birth, there simply wasn't enough time and energy left over for that afterward. This brings me, finally, to the originally promised subject of blog-matter, and how it might be used to substantiate the insubstantial. Amateur psychiatrists should pay particular attention, because it illuminates the process I often employ in the creation of so many notes from the edge monologues. Professional psychiatrists may find it illuminating for other reasons. On Friday, I was certain about two things: I had overlaid my original pen and ink drawing (nifty orange sunlike blob included at no extra charge) with the words, "hide in plain sight," and those words were rendered in such a way as to make them virtually invisible on the Zazzle site. What to do? I mean, hidden is one thing, but invisible isn't necessarily what you're after where posters are concerned. Suddenly, it struck me that I could simply enlarge one section of it, put it up on the blog, then use it as an excuse to fire off another one of my infamous Friday notes from the edge offerings. Har! Having thus reduced the equation to the lower left corner of the poster—the other three words wouldn't have worked by themselves—the next problem was coming up with a few loosely related sentences with which to surround my graphic. I thought about the concept of hiding in plain sight in several contexts. One of them was the thankless task of prevention, i.e. those whose job it is to keep bad things from happening. In that role, success means a certain invisibility; no one notices things that aren't happening; success hides in plain sight. Another had to do with a lifestyle that requires secrecy, e.g. espionage, undercover narcotics, or a professional assassin; the person hides in plain sight. I considered more typical scenarios, too, such as the increasingly common financial pressures; people may wind up hiding from creditors, or worse. The list goes on, but you get the idea. As luck would have it, I didn't have to work that hard, or worse yet, move into the quagmire of seriousness for a Friday monologue. A blog that shows up via my RSS feeds provided the trigger, and in concert with a certain commenter on the same blog, gave me all the ideas I needed to fabricate a set of sentences suitable for my notes from the edge category. The whole pink moustache thing probably speaks for itself, or ought to; it's difficult to imagine such a non-subject in a context much beyond satire, if it even gets that far. The four ludicrous Spanish terms were triggered in exactly the same way, and though they certainly qualify as inside jokes for those of us who hang on every other word of The Fire From Within, they have no intrinsic purpose beyond the casual—yet Full Bozo—expressions typically used in the Omegaword venue. Maybe it's just me, but whenever I contemplate the sheer absurdity of those terms, I'm overcome with the desire to get up and snort. Har again! 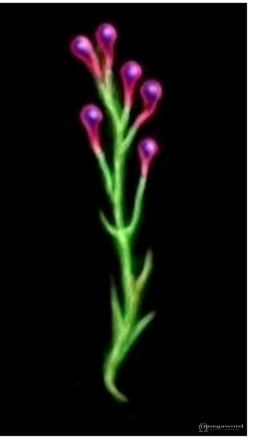 Anyway, I'm including a graphic of the little alien plant I put on a greeting card over the weekend, partly because I can't think of anything else to put up there, and partly because my joints and eyes are still jacked from all the computer time during the past weeks. Any hidden meaning contained therein is purely coincidental, and is best deciphered using reverse-speech techniques. You read me like a book. A BOOK OF MATCHES! HAHAHAHAHAHAHAHAHAHAHAR!!!! !